Well, it’s done – 790 km, according to my guide book! I’ll have more to say later, I hope, but wanted at least to make a post to announce my arrival in Santiago. 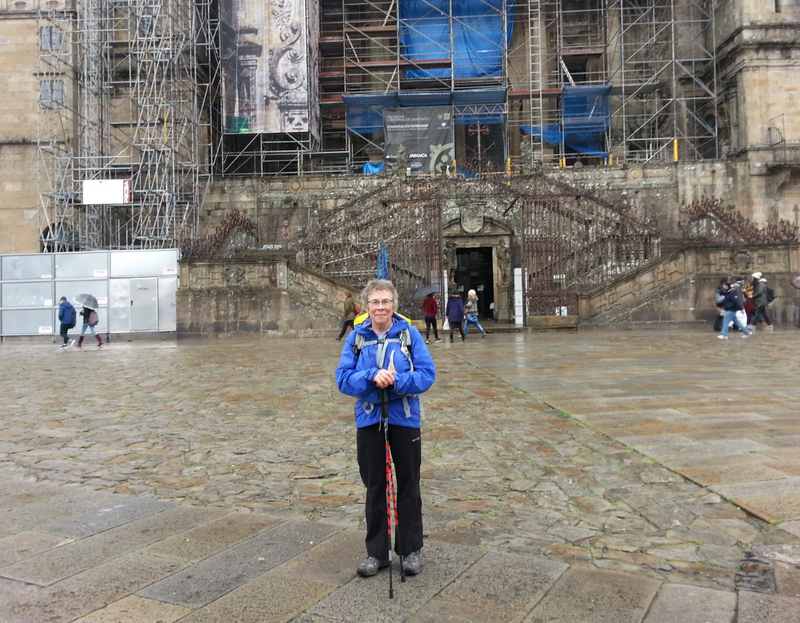 Having done the heroic job of posting every day of my Camino, I don’t expect to keep it up! November 24, 2015 in Camino 2015. Congratulations Clare. It looks a bit wet – I hope the sun shines on you tomorrow and that you have a lovely relaxing day. Congratulations on the completion of your pilgrimage. Thanks so much for letting us follow you every day – great job by the way. Congratulations on a marvellous achievement! I will miss your daily posts which take me back to my Caminos. Still raining in Santiago, I see. Scaffolding still up, too! I think the scaffolding is growing. Congratulations! I loved seeing a post from you everyday, and it was such a joy to follow along with your journey. Thank you for sharing your Camino with us! You did an excellent job of posting. I loved your comments and photos. I even have a callous on my foot from following! If you managed to get a callous but skip the blister, you are ready for a long walk! So thrilled for you, third time is the charm. Will miss your daily postings. Hmm. Maybe the fourth time would be the charm! Claire…..congratulations….I hope you’ll take some time to celebrate in Santiago! Great post! I can’t wait to spend my January reading through your blog posts. My husband wants to do a three-week Camino, but I ‘HONESTLY think that he would regret not spending at least four weeks, so unbeknownst to him, I will book a four-week trip. If I did what I really wanted to do, and booked six weeks, I think he would be too irritated…. Wow, what a huge achievement! Congratulations!